Version 2.0 of my Walt Disney World + Orlando Vacation planner is now here! Or continue reading to download the original planner! One of the most popular free printables on my blog is my Walt Disney World + Orlando, Florida Vacation Planning Printables set, and it’s due an update as it’s been announced that Downtown Disney, is now formally known as Disney Springs! So, I’ve updated the printable pack to reflect the name change, and to avoid confusion when planning. I have, for the time being, left DisneyQuest within the pack, as that doesn’t shut until early 2016. There is also talk of Wet ‘n’ Wild closing to make way for a new waterpark. I will update again when this is open! 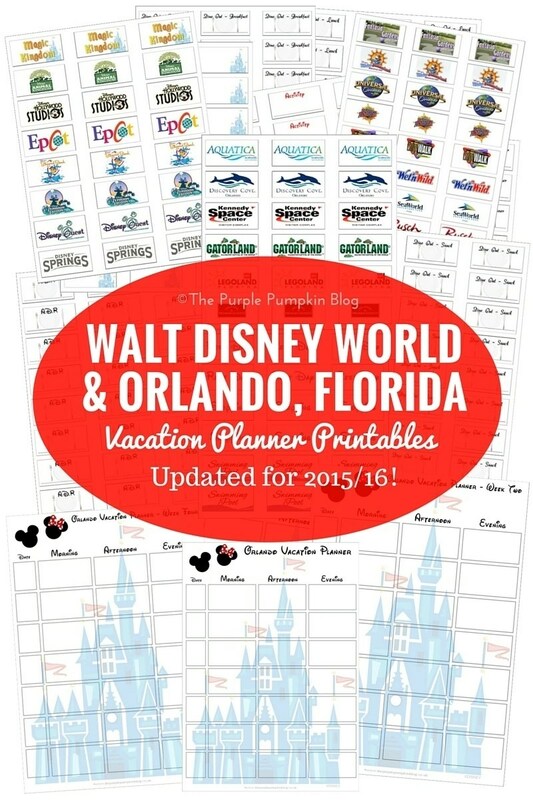 Download the updated Walt Disney World + Orlando, Florida Vacation Planning Printables here. ), as it’s one of the best Walt Disney World guide books out there! Along with the tools I use for planning our family vacations to Orlando here. The calendars are a week to view, with a space for you to write in your dates and space for morning, afternoon and evening planning. All you have to do is cut out the labels and start planning your Walt Disney World Vacation and Orlando, Florida vacation! Don’t plan your holiday without it! Thanks for reading Day 78 of 100 Days of Disney 2015! 22 to go! Come back tomorrow for another Disney post! I love all your printables. And this planner has been so useful for me to plan our Halloween holiday. I laminated mine and it looks fabulous! I also have printed the trip reports (adults and kids versions) and cant wait to use them. Will there be a Halloween Olaf coming soon? We love Frozen in our house and I think laminated versions with Velcro on the back and piece of felt background would be great for a plane activity. I love when I hear people find them helpful and use them! Makes it all worthwhile! There is a Halloween Olaf coming – next week I hope – still need to make him!!!!! !